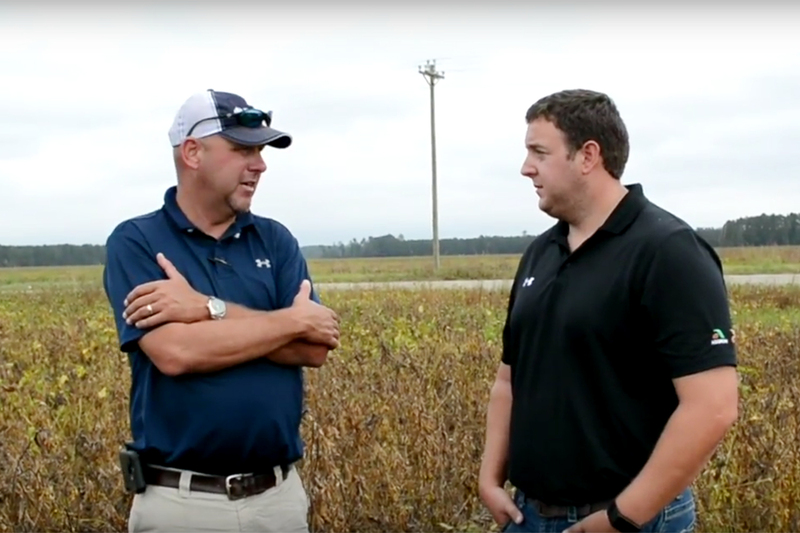 For several years, Charlie Baucom, Bentwood Farms, had seen consistent yields with his soybeans, but just knew he could do better. So he sat down over the winter with his team from Southern States, Steven and Brandon Harrelson, and his Monty’s representative, Michael Thompson. The result was a high-intensity management program that would not only produce higher yields, but also improve the health of his plants and the soil. They also realized there would be quite a few moving parts to the plan: location, seed, timing, chemicals, etc. Pictured above are Charlie Baucom and Steven Harrelson (right). Now that they have the basic formula down, they will continue to tweak the program “It’s a work in progress, and you gotta keep doing it,” said Baucom. “Humi-Till is a great example we are going to tweak next year. We didn’t have that product on these soybeans… we will next year. I feel like Agrihance will go out twice next year,” he added. “There were some windows with the program that it could have gone out here or it could have gone out there – and the answer was: it goes out both places and we’ll have paid for it. More than paid for it! So yeah, there’s definitely a program that we’ll stick to and tweak each and every year.” Tweaking the process with a goal of even higher yields and ultimately the state record! For more information, contact your Monty’s representative or call 1-800-978-6342.